The other day I was filling my 108-count Acrylic Display Case with my Hot Wheels Custom ’77 Dodge Van collection and noticed I had still yet to open two releases: the “Mummy Marauders” Color Shifters Creatures release and the 2015 Super #Treasure Hunt. I had planned to do a #Showcase on this #Custom ’77 Dodge Van from the #2015 Hot Wheels #HW Performance Series for quite some time, but never found the right occasion to set this one free. Well, that was the day and it is time for that showcase! One of the best things about Hot Wheels Super #Treasure Hunts is they give us a glimpse at some “less-heralded” castings getting the premium treatment. Its kind of a faux-reality though as these mainline cars still have their plastic bases, so that is why I adhere to the term, “glimpse”. As you can see, the super treasure hunt is essentially an upgrade over its common variant friend. In most cases, the $TH variants offer premium #Spectraflame Paint, #Real Riders, and additional detail/graphics. This release of the #Custom ’77 Dodge Van does just that — with my favorite part being the additional detail/graphics on the back. Notice the addition of taillights and #Mooneyes deco? The Hot Wheels #Custom ’77 Dodge Van has been a personal favorite of mine since it made its debut in 2008. I had always loved the older #Super Van casting, but this #Jun Imai Designed #Van became a favorite the minute I saw its lower-stance paired with that panoramic window on its roof that reveals 4-point harnesses in all of its seats and two giant nitro tanks strapped to the rear doors (in the interior). Its a van with a lot of character — some of which often gets overshadowed by its busy designs. The #Mooneyes livery on this #2015 Hot Wheels #HW Performance release looks like it could be something you see in today’s #Car Culture line. Given that the Super TH has some extra detail, premium paint and #Real Riders, it gives us that glimpse of what this van could look like as a Car Culture release. Hopefully we can move this casting from “billboard-status” in the #Pop Culture line to “Collector-Model” in Car Culture. Vintage Van series anyone? …. BUT … If two cars are going to change your mind about being set on vehicles with the #Mooneyes livery being yellow, it are the two below. Both this 2015 Super #Treasure Hunt #Custom ’77 Dodge Van, and the 2014 #HW Performance Series #Custom Volkswagen Beetle in #ZAMAC, are my two favorite Mooneyes releases from Hot Wheels — and they’re not yellow! The only thing that disappointed when it came to the #2015 Hot Wheels #HW Performance release of the #Custom ’77 Dodge Van is that it only came in the yellow colorway with the Super #Treasure Hunt #Variation. Other #Mooneyes releases have come in Matte Black or #ZAMAC and this #Van would have looked great in either. RELEASE DETAILS: Yellow Body (metal). Tinted Windows. Black Interior. Chrome Muscle-Car 5-Spoke (MC5) Wheels. Chrome Base (plastic). Made in Malaysia. Toy# CFH46. Released in 2015 as part of the HW City – HW Performance series. You’ll notice the tampos on the left side of the common variant… I’ll note that it is hard to find one that doesn’t have the rub from the blister card. Its unfortunate, but still doesn’t ruin how great this release was. And that Super??? Well, that is in a class of its own. I may be bias because I collect this casting, but it is one of the best Super #Treasure Hunts to have ever been released. RELEASE DETAILS: Spectraflame Gold Body (metal). Tinted Windows. Black Interior. Silver Real Riders Moon Disc (RRMD) Wheels. Chrome Base (plastic). Made in Malaysia. Toy# CFJ33. Released in 2015 as part of the HW City – HW Performance series. 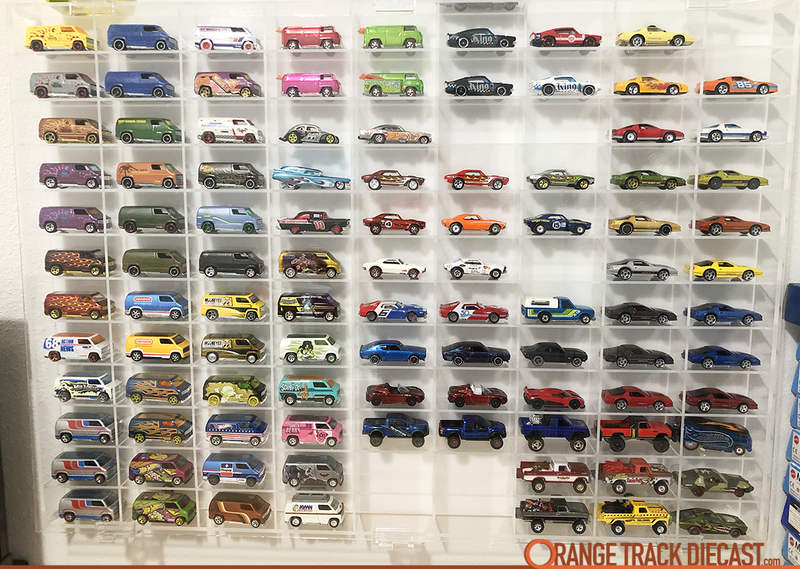 Unboxing The History of Hot Wheels Set II; Take a look at all 8 cars! I agree with you! I’m searching for both of these; either my trade or purchase and I enjoy this casting. I would love to see a ‘70/80 Van Series in Car Culture form. Some crazy hippy pain scheme or the ol western scene on the outside. Thanks for the pics and the side by side. Amazing As Always Brad! Love the Site & your YouTube channel your knowledge is vast!